When mall developer Phoenix Mills Co set up the Palladium Mall in 2010, the intention clearly was to position it as a luxury mall. 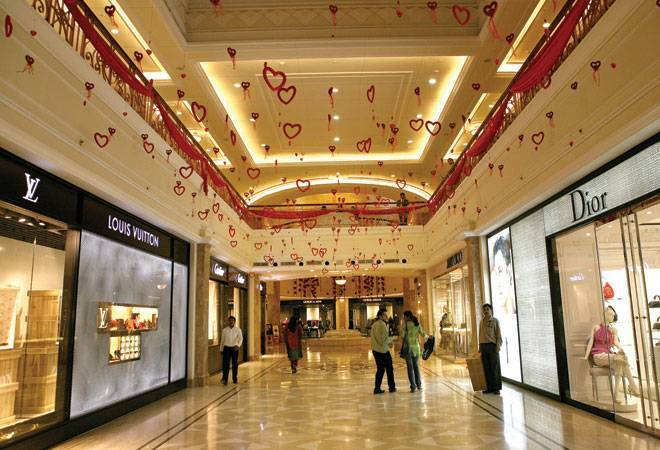 With high-end brands such as Gucci, Tag Heuer, Michael Kors and The Collective setting up stores, the Palladium Mall promised to be the destination for high-end luxury shopping in Mumbai. However, luxury brands today probably occupy just a fraction of the retail space spread over 400,000 sq. ft. In fact, the financial capital of the country is yet to see a luxury mall. The country has just two luxury malls - DLF Emporio in Delhi and The Collection (UB City) in Bangalore. How long will it take for India to create a luxury high-street like Madison Avenue and Fifth Avenue in New York? It is definitely a distant dream at the moment. Arvind Singhal, Chairman of management consulting firm Technopak, says that India doesn't have the culture of luxury brands on high streets because of safety and security issues. That's the reason why most luxury brands in India are housed in the shopping arcades of five-star hotels. The monthly rent of these outlets would be Rs 600 to Rs 1,000 per sq. ft, say industry sources. With Indians increasingly travelling abroad, their awareness about luxury brands is on the rise. So, luxury shopping logically should happen at least in the metros. This means that luxury malls as a concept should work. So, why does India have just two luxury malls? "The luxury consumers are frequent overseas flyers and they really don't care about buying here," points out Rajneesh Mahajan, Executive Director, Inorbit Malls. Indians do indulge in luxury shopping, but it's mostly overseas as it's 30-40 per cent cheaper, largely because the import duties on luxury items are very high. Moreover, luxury shopping in India until recently was fuelled by black money. Sales were affected after the government started monitoring expensive transactions, says Singhal of Technopak. In fact, a bulk of the luxury shoppers, according to a senior luxury branding consultant, prefers shopping for luxury brands in the comfort of their homes in order to avoid paying taxes. However, considering the country's projected GDP growth and rise in disposable incomes, mall developers are hopeful that the luxury market will also evolve. Retail industry consultants say that the Mukesh Ambani-controlled Reliance Industries plans to enter the luxury mall space either in Mumbai or Delhi. There were also reports that Mumbai-based Oberoi Realty and Maker Group were looking to build luxury malls in the city. But there is no clarity on when these will happen, if ever. With growth of legitimate wealth in the country, Singhal of Technopak is optimistic about a robust luxury mall culture in the country. Still, setting up luxury malls isn't going to be easy in an emerging economy like India. The cost of construction of a luxury mall is almost three times more than a regular mall, and while the returns are also higher, the fact remains that most Indians prefer doing luxury shopping abroad. It takes three to five years to build a luxury mall and the average cost for overall development (excluding the land cost) in Mumbai and Delhi is in the range of Rs 7,000-9,000 per sq. ft, compared with Rs 4,000-5,000 a sq. ft for a normal mall, say real estate developers. The rental for a luxury mall ranges from Rs 500 to Rs 1,500 a sq. ft per month, while regular malls charge much lower. Devangshu Dutta, CEO of Third Eyesight, says that developers have to ensure a holistic experience for customers at luxury malls. "The collections should be the latest and the service should be ultra-premium. Pricing should be competitive, considering the higher import duty on luxury products." The difficulty is in finding real estate at an ultra-posh locality for building the mall, he adds. Today, most luxury stores in a mall like Palladium in Mumbai often look deserted. Clearly, given the challenges, developers will definitely think twice before launching luxury malls.